The SGA executive led by our amiable president, Ama Achiamah, gave a much-needed break from studies as they organised this semester “Multicultural Event” for all students, faculty and staff. The multicultural event which was held on Saturday, July 21st, 2018, was a huge success jam packed with lots of fun, laughter, socializing, entertainment and fashion statements, not forgetting the variety of finger-licking delicacies made by several students. It was held in the B2 classroom located in the 1st floor of International American University, next to the cafeteria. 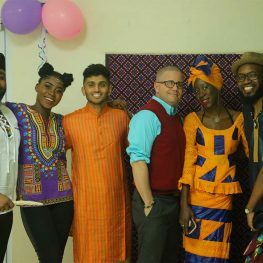 The event is aimed at showcasing unique cuisine, apparels and lifestyle of the wide variety of cultures represented at the University. The program was jointly hosted by Raymond Mbah and Alfred Uradu who kept the atmosphere lively with gist and music. The event kicked-off at about 7:00pm with prayers and a warm welcome by Raymond followed by an opening remark by the Dean of Students Affairs, Dr. Rasheed Agboola. The early birds had a glamorous red-carpet reception with professional photographs of them taken. The audience was serenaded with a beautiful rendition by Dr. Poornima and her daughter, Dr. Soans and the fantastic trio (Praise, Mimi and Alfred), followed by exhilarating dances by Kaveri and TIV angels, magnificent glamour from the cultural fashion showcase and a variety of games which included musical chair, trivia games for both faculty and students. After the three-course dinner was served, closing remarks were made by the Dean of Basic Sciences, Dr. James Villanueva and the Executive Dean, Dr. Patrick Gannon, followed by a thank you speech by the SGA President who was called out with her team of executive, after which the event came to a conclusion with closing prayer and BOOM……people had to put on their dancing shoes as DJ Alfred scratched.